Dentists are struggling to get their patients to go ahead with necessary and important treatment. I can see many heads nodding as they read this. Most Dentists at some point have this concern. You may have this concern a lot of the time. Patients saying yes to their dental care and treatment is what keeps your business going and what helps your patients stay healthy. It is so important and so many Dentists desperately want to know the answer. Have you ever wondered why your patient says no to treatment when you know you did the most amazing treatment presentation and the patient nods their head and says yes to you? Have you looked at the appointment book and the patient said yes to treatment but they are not booked in the appointment book? Have you seen that they are all booked in for their treatment and then all of a sudden on the day they cancel the appointment? The answer is easy. It is not one thing you do that helps your patients say yes to dental acre and treatment. It is many things. 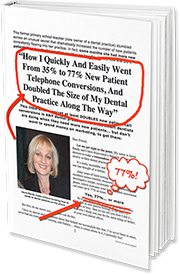 attract patients to your practice with your referrals, marketing and advertising. You can see it is not one thing that gets patients saying yes to treatment. Have a close look at everything you do and say to your patients. You will soon discover what you are doing well and what is not so good. If you don’t get all the things you do and say to your patients, right, then it doesn’t matter how amazing your treatment planning is with your patients they will continue to say NO to treatment. Bathurst Master Class- Friday 29th March 2019.